Last month, Bihar was hit but fierce floods that disrupted as many as 17 million lives in 19 districts of the state, and killed 500 others, including women, women and children. The devastating floods, destroyed roads, vehicles, buildings, homes, fields and everything that came in its way, particularly in northern Bihar where 76 per cent of the population lives in flood-prone areas. However, this year, the floods broke a nine-year record of deaths in the state, putting the government, NGOs and individuals into rescue and relief mode. DEF, too, was among those working in the flood-affected regions of Bihar. It is understood that these floods were a result of sudden increase in water discharge due to torrential rain in the foothill of the Himalayas in Nepal and adjoining areas of Bihar between August 12 and 20, which led to the flooding of various rivers, especially Gandak, Burhi Gandak and Bagmati, Kamla, Kosi and Mahananda. DEF and its team of hundreds of Internet Saathis got together to report, support and organise relief activities in the flood-affected areas. Equipped with Internet-enabled mobile phones, Internet Saathis came forward to provide immediate help and relief to flood-stricken people, especially around East and West Champaran, Darbhanga, Vaishali and Gopalganj districts. Internet Saathi is a project initiated by Google India and Tata Trusts, and implemented by various partner organisations across the state. DEF is the implementation partner for Bihar and Madhya Pradesh. In Bihar, the project has been active in 80 blocks. 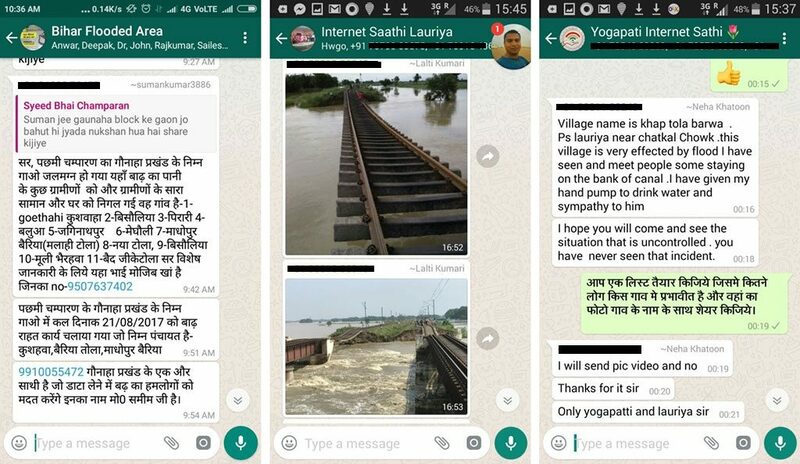 After the floods hit Bihar, several Internet Saathis began to share reports & stories from the ground, news pieces & weather updates, photographs & videos of devastation, helpline numbers & other relevant information in real-time via individual WhatsApp chats and groups. Another WhatsApp group was created that connected DEF ground staff with those stationed at the Delhi headquarters to share information and seek help. This helped DEF disseminate this information further to relevant district authorities, relief organisations, social workers and emergency helplines to strengthen relief efforts in the region. The Saathis were also instrumental in bringing together hundreds of community members to work together to provide relief, assistance and emotional support to those affected by floods. 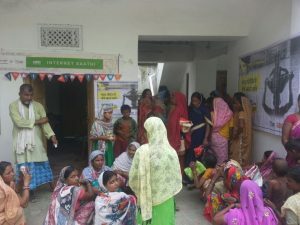 Through the efforts of Internet Saathis and those mobilised by them, DEF was able to set up a relief camp in Ramnagar Gounaha where it distributed 100 quintal rice, 200 packets of flat rice flakes, 140 packets of puffed rice flakes, and hundreds of kilos of potatoes, onion and other food items among 800 affected families. As a collective civil society effort, the Internet Saathis also distributed medicines, milk and other essentials. The efforts of the Internet Saathis did not stop there but they went door-to-door to seek help from families, in whatever capacities they could. As a result, they were able to collect Rs. 17,456, besides support in kind for food, clothing and emotional strength. In this time of emergency and need, the army of empowered and digitally sound Internet Saathis showed great strength and strong links to support their community and their villages. One of DEF’s centres, started in collaboration with Oracle and CAF India, in Narkatyaganj block of Bihar was reduced to a pool of soil and water, with some of its infrastructure floating away. Though the centre staff and students managed to protect most of its digital infrastructure, most documents and stationery were lost in the flood. Amid high levels of water, the centre was forced to shut down activities for half a week before it came back to life, with a stronger determination to digitally empower local families.